JaggerSpun Maine Line is a worsted spun** wool yarn long a favorite in the commercial sweater market. This versatile yarn can be used successfully for hand and machine knitting and weaving. All colors in our Maine Line collection are available in 2/20 & 2/8 weight. • 100% medium grade wool. Mothproofed. • Dry clean or hand wash in cool water and lay flat to dry. These yarns are sold on one pound cones (a little less than half a kilo). Please email us if you are interested in purchasing less than 3 cones at a time. 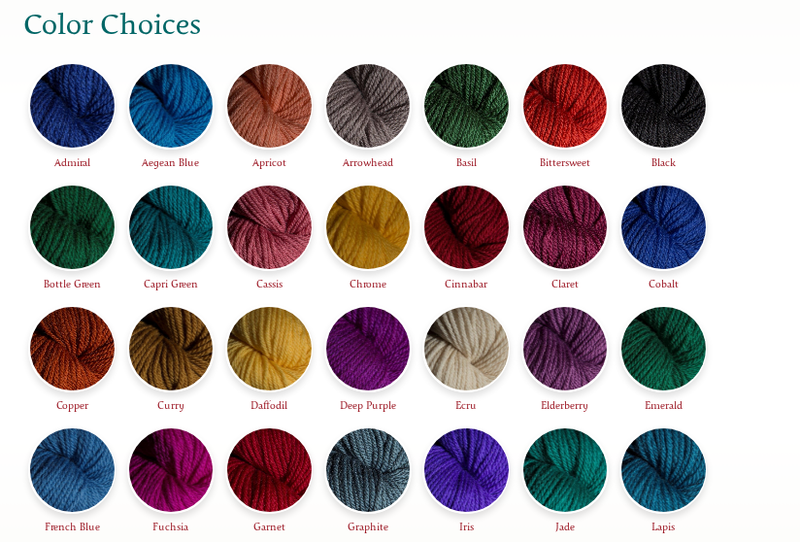 Maine Line yarns cost $35.50 for 2/8 and 3/8 & $38.50 for 2/20. To be adjusted. If you want to pay by check or money order, please email us and we'll send you the total and mailing info.